In a highly unusual move, Apple early Saturday released iOS 11.2 with support for Apple Pay Cash, 7.5-watt charging on compatible devices and — tellingly — a fix for a nasty date bug that can cause devices to enter a soft reset loop. Available via Software Update, iOS 11.2 appears to have been pushed out early to deal with a recently discovered date bug that can cause springboard to crash, rendering an affected device barely usable. Detailed in a series of posts to online forums and social media services, the bug is seemingly tied to local notifications generated after 12:15 a.m. local time on Dec. 2. Users noted at the time that iOS 11.2, then in beta, did not suffer from the date bug, suggesting Apple rushed its release in part to deal with the problem. As seen in a Support Document published at around the same time that iOS 11.2 went live, Apple urges users who are experiencing unexpected restarts to disable notifications and install the latest version of the mobile operating system. 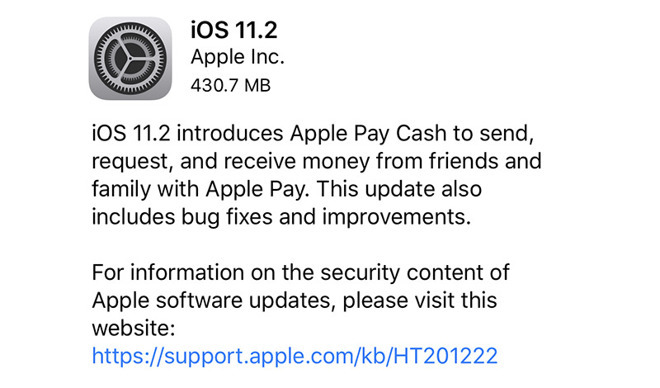 Along with the date bug fix, iOS 11.2 is supposed to activate Apple Pay Cash, the company's peer-to-peer money transfer solution, but backend support does not appear to be live. Embedded as part of Messages, Apple Pay Cash allows users in the U.S. to send money to other Apple Pay users via a prepaid cash card which can be used for Apple Pay transactions. Alternatively, users can transfer funds to their bank account. The latest iOS version also enables fast 7.5-watt wireless charging for iPhone 8 and iPhone X handsets. Introduced this year, wireless iPhone charging was initially limited to 5-watts of power, the same throughput as Apple's wired adapter. The company promised faster charging speeds would be enabled through updated firmware. Other odds and ends include three new Live wallpapers for iPhone X, improved video camera stabilization, support in Podcasts for automatically advancing to the next episode from the same show and support in HealthKit for downhill snow sports distance. Users can download the 430.7MB update by navigating to Settings > General > Software Update.